He founded online grocer Webvan, which promised to drop your groceries on your front porch within 30 minutes of ordering. By 1999 business was booming. Management decided to take advantage of investors' silliness during the dot-com bubble and list Webvan on the stock market. The stock debuted at $15 on a Friday morning. That afternoon it closed at $24.88–good for a 65% gain in one day. Somehow they had forgotten that selling groceries is a ferociously competitive business. On average, grocers make less than two cents profit on every dollar of revenue. This is why Webvan lost money on every delivery. It cost far more to deliver the groceries than Webvan could possibly sell them for. The math just didn’t work. Investors sprinted for the exits, crashing the stock down to $0.06/share. Webvan shut its doors for good in 2001 and donated all its remaining food to a food bank. For 25 years, every attempt to disrupt the colossal $1.5 trillion/year US grocery market has failed. But almost none of it happens on the internet. 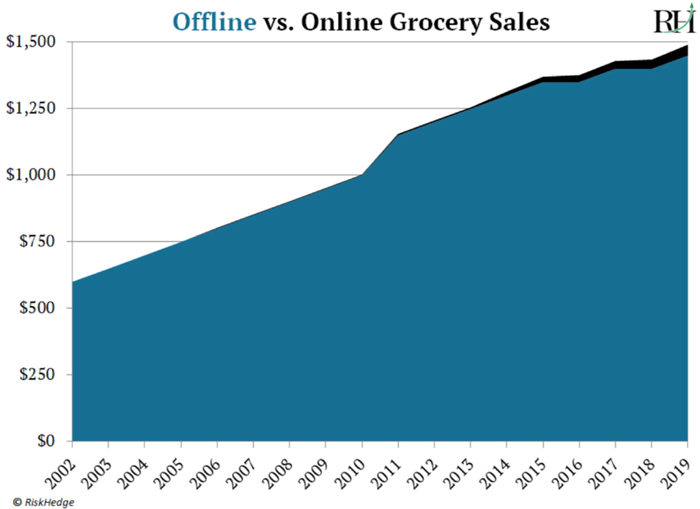 You can see on this chart that a tiny 2% sliver of total grocery sales in America happens online. While 30% of electronics purchases take place on the internet. Amazon’s (AMZN) disruption of retail is one of the stories of the century. As you know, it has driven once-iconic stores like Sears and J.C. Penney to the brink. And according to leading retail research firm Nielsen, more than 21,000 stores have shut their doors in the past five years. Along the way early Amazon shareholders have gotten rich on 116,000% gains. And founder Jeff Bezos has accumulated untold wealth. He’s not only the richest guy in the world—he’s the richest person in modern history. But did you know that the American grocery market is 3x bigger than ALL of the online retail market? In other words, we spend 3-times more money on groceries than we do buying stuff over the internet. Yet there’s been virtually no disruption in groceries over the last 60 years. Most suburban Americans still drive to the grocery store. We still push a cart up and down the aisles. We still place our items on a conveyor belt at the register. It’s pretty much the same as it was in the 1960s. Until recently, even mighty Amazon has been stumped by groceries. It rolled out a grocery delivery service Amazon Fresh back in 2007. Since then Fresh has lost money every year. After a decade of failing to turn a profit, Amazon folded Fresh in most US cities in 2018. In 2017 it set down a new path. As you may remember, that’s when Amazon bought the Whole Foods supermarket chain for $13.7 billion. Whole Foods is the largest natural and organic grocery chain in America. It operates roughly 470 stores around the country. Acquiring Whole Foods is Amazon’s first step into physical grocery stores. In the next two years it plans to open 3,000 “Amazon Go” stores in the US, according to Bloomberg. Amazon Go stores are Amazon’s “checkout-free” stores. They completely remove the time-consuming checkout process. You walk in… scan your phone to verify who you are… pick up what you want… and walk out. This solves the biggest problem with online groceries… delivering fresh produce to skeptical customers. In a 2019 eMarketer survey, 90% of shoppers said they’d buy groceries online from their current grocery store. Just 4% said they’d buy from an “online only” grocer. But they don’t want to have milk and meat shipped to them from some warehouse 50 miles away. They want to buy groceries from companies with a local physical presence that they trust. Walmart (WMT) sells roughly one-fifth of all groceries in America. With 5,300 stores in the US alone, it already has a store within 10 miles of 90% of American households. Roughly 95% of Walmart’s sales happen in its physical stores. But over the past three years it has plowed $20 billion into efforts to step up its online presence. That’s helped propel it to become the third-largest online retailer in America… behind only Amazon and eBay. By the end of this year, same-day grocery delivery from Walmart will be available to 60% of US households. That’s 195 million people who can choose to have their weekly shopping delivered to their doorsteps. As I mentioned, just 2% of the $1.5-trillion grocery market is online today. As Walmart and Amazon go all-in, this should jump to around 20%. That’s 10x growth... and it’s coming much faster than you might expect. By the end of this year, more than 80% of Americans will have access to online groceries. My team is doing a special research project to identify who will win these grocery wars. 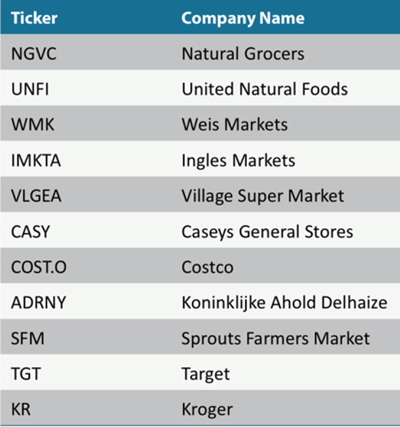 Many smaller grocery chains are in big trouble. A study from consulting firm Oliver Wyman found that if just 8% of the grocery market moves online, one-third of all grocery stores will shut their doors. You see, small grocers tend to be fragile because they survive on razor-thin margins. The average net profit margin for grocery stores is just 1.9%. As I mentioned earlier, they make less than $0.02 in profit for every dollar of sales. With such slim margins, even a small dip in sales can ruin their business. Amazon and Walmart are two of the biggest, most powerful companies on earth. They’re like a couple of 800-pound gorillas marching in on small grocers’ territory. A tidal wave of disruption is about to hit all of them. Some will end up like Borders, RadioShack, and Toys R Us: bankrupt and in retail heaven. We're in the early stages of a big shift in the way people buy groceries. And the least amount of spending occurs online. It’s shaping up to be a disruptor’s dream. I’ll have a lot more to say about this in the coming weeks. Have you ever ordered groceries online? If not, why not? Tell me at Stephen@RiskHedge.com.